Does hay fever affect you in Spring? Keep this Elderflower Tea in your pantry to relieve the symptoms of nasal congestion, sinus inflammation, runny nose, headache and itchy eyes. Ironic perhaps that this flower can help reactions to pollens..
Elderflower has been used in traditional medicine all over the world in many different cultures due to its antiseptic and anti-inflammatory properties. The most common uses are for, sinus infections, respiratory disturbances and colds and flu. Elderflower has antibacterial and antiviral properties and may also help alleviate some allergies and boost the functioning of the immune system. Topically, elderflower might help reduce pain and swelling in joints due to some forms of arthritis and is used to stop bleeding. 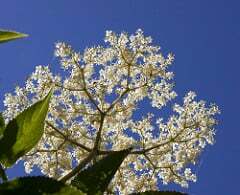 As an oral rinse, elderflower can be used for its antiseptic properties as a mouthwash and gargle. Elderflower also reduces blood sugar levels, very similar to the way insulin works¹. Hay fever Relief Tea now available in store at Freedom Chinese Medicine for $11.50. Contact us on 9486 5966 if you’d like us to put some aside for you.